In December 2016, the United Nations General Assembly adopted a resolution (A/71/L.38) recognizing the potential of sport as a valuable tool to bring about positive social change and build a peaceful and better world. 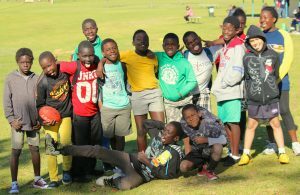 The Edmund Rice Centre in Perth Western Australia (ERCWA), has provided sporting activities for young people of Aboriginal and Torres Strait Islander (ATSI) and newly arrived Culturally and Linguistically Diverse (CaLD) backgrounds since 2005. Its programs aim to use sport and leadership as vehicles for personal and professional development, while providing opportunities for youth to develop leadership skills and become active and engaged members of society. In 2010, the Edmund Rice Lions multicultural AFL (Australian Rules Football) team was launched, the first multicultural AFL Team of its kind in Australia. This allowed bridges to be built between mainstream Australians and newly arrived youth through their adoption of Australia’s game. It promoted greater understanding through mutual respect of the talents and endeavor of the young people. The local African community took to the program heavily and many of those who went on to play for local clubs were the first Africans in their clubs. They shared their stories with the club members, helping win hearts and minds and change attitudes to refugees among large groups of mainstream Australians. In 2011, the Centre was mandated by the West Australian Government’s Department of Sport and Recreation to expand their successful program model into the City of Wanneroo and was subsequently credited for a reduction in antisocial behaviour in the city. In the same year, the Centre launched the Banksia United Aboriginal soccer team, which uses sport as a medium to build team spirit, discipline and fair play as well as to promote a healthy lifestyle and cultural understanding through the involvement of young coaches from CaLD backgrounds. The world game is thereby used to promote cultural harmony and better understanding of Australia’s Indigneous culture among newly arrived youth. In 2012, ERCWA launched the Local Parks Project, which engages young people in introductory level sporting activities on a local parks setting. The program has expanded to service five local parks in areas across two of the most culturally diverse local government districts in Australia, the Cities of Stirling and Wanneroo. In 2013, the Butler Falcons, the first all-female multicultural AFL Team in Australia was launched by ERCWA and has gone on to enjoy enjoyed massive success both on and off the field. In 2016, the Butler Falcons were the faces of ‘Refugee Week’, a national campaign that raises awareness and promotes the contribution of refugees to their adopted country. Other initiatives include the “Pathways off the Park” program which targets young people who want to pursue their sporting, personal and professional development by adding a high-performance component to the local parks setting, and the ‘Common Goal Soccer Academy’ which builds bridges between Police and the local Muslim community. In its first year of establishment, over 100 people of non-Muslim faith entered a Mosque for the first time as guests of the local Imam and the congregation – a small step towards combating the racism and bigotry that is currently fed by populist movements around the world. Taken all together, this suite of unique and complementary sports programs together with the centre’s Youth Leadership Program, have empowered a generation of young people who may have otherwise been on the margins of society. They have brought positive change to the Perth metropolitan region and are helping to build a more harmonious community.